This article was first published in Forbes India. It’s very long, so I’m only putting up a small quote of his. The article, all four pages of it, is here. This review was first published in Mumbai Boss. 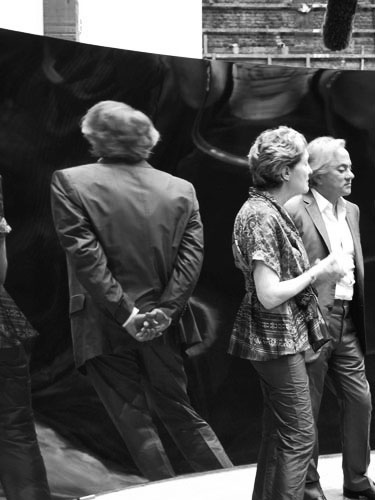 Kapoor’s first exhibition in India is a grand two-city affair that has predictably led to comparisons. But it’s a silly idea to force a face-off because Kapoor has curated the two exhibitions with very distinct objectives. The National Gallery of Modern Art in New Delhi offers a retrospective while in Stage 3 of Mehboob Studios in Mumbai, are nine works, made between 2006 and 2010, that are very much of the present. They masterfully showcase what has been a subtle leitmotif in Kapoor’s work for decades: violence. The massive Mehboob Studios is a fantastic setting. Its industrial feel and the rough decay of its walls and floors provide an interesting contrast to the smooth sophistication of Kapoor’s installations. In two corners are “Stack” and “Shooting into the Corner”, bracketing the show with red wax. “Stack” stands like a monument made of bloody pulp. There’s a radiance to the wax because it catches the light beautifully, which adds to its bloody, fleshy quality making it all the more disturbing. “Shooting into the Corner” is one of the most powerful works Kapoor has made till date. As the phallic cannon splatters the white-walled corner with red, it’s impossible to miss the sexuality of the image being created. 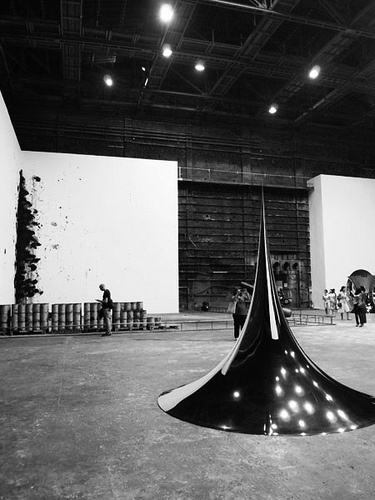 Kapoor was inspired to make the installation by the destructive quality of Viennese Actionism. It then went on to become a response to the idea that abstract art is simply splattering paint upon a canvas but “Shooting into the Corner” is more than a cheeky salute to past painters. The corner is literally the cornerstone of architecture, which is one of the markers of an advanced civilisation, much like military technology. The cannon also adds references to colonisation in India, and the violence that marked the process of one culture trying to civilise another. The mirrored works sit inside the frame created by the two wax works. Their metallic look may seem the diametrical opposite of the visceral feel of the red wax but Kapoor’s mirrors aren’t there to reflect as much as dismember. The mirrored works are rarely favourites of critics. They’re generally deemed to be too carnivalesque and intent upon being spectacular, which is of course precisely the reason they’re favourites of most visitors. The mirrored surfaces play upon our narcissism, just like crazy mirrors do at funfairs. But Kapoor’s mirrors are more malevolent than their carnival counterparts. Their shine draws the viewer near, urging one to look for themselves only to cruelly distort everything out of shape. Faces are stretched on invisible racks, walls melt into swirling eddies, bodies lose all proportion, clothes turn into abstract dabs of colour. Some, like “Non-Object (Pole)” remove the person entirely from their surroundings. In the list of Kapoor’s mirror tricks, perhaps the most boring one is the untitled concave disc that merely turns the world upside down. Its alter ego is another concave disc, which is magnificent. Also untitled (we’ve nicknamed it “Shatter-pattern”), the surface is a mosaic of mirror fragments that don’t just turn the world upside down but also transform it into a weird, Cubist abstraction. However, if you look closely at the disc, you’ll realise that the smaller mirrors show you the right way up. We’re tempted to see a subtle reference to Damien Hirst’s “For the Love of God” in the shiny, diamond-like surface of this disc, which shows a crazy world that proves to be an illusion when the viewer looks closely. But maybe we’re being too imaginative.